28 an Gearran - Leig Pàpa Beinidict XVI a dreuchd dheth. 13 am Màrt - Thaghadh Phàpa Frangan I, ann an Cathair na Bhatacain. Bhuannaich Alice Munro an Duais Nobel ann an Litreachas. 11 am Faoilleach - Robert Kee, craoladair mun Dàrna Cogadh is Èirinn. 14 am Faoilleach - Conrad Bain, ann an Liverbridge. Actair à Canada. 13 am Màrt - Malachi Throne, ann am Brentwood. Actair às na Stàitean Aonaichte. 28 am Màrt - Richard Griffiths, ann an Coventry. Actair à Sasainn. 4 an Giblean - Roger Ebert, ann an Chicago (Illinois). Sgrìobhadair às na Stàitean Aonaichte. 8 an Giblean - Margaret Thatcher, ann an Lunnainn. Tè-phoileataigs à Sasainn. 11 an Giblean - Jonathan Winters, ann an Dayton. Cleasaiche à Ohio sna Stàitean Aonaichte. 19 an t-Ògmhios - James Gandolfini, cleasaiche às na Stàitean Aonaichte. 30 an Lùnasdal - Seamus Heaney, ann am Baile Átha Cliath. Bàrd à Èirinn. 12 an t-Sultain - Otto Sander, ann am Berlin. Cleasaiche às a' Ghearmailt. 19 an t-Samhain - Frederick Sanger, ceimigear à Sasainn. 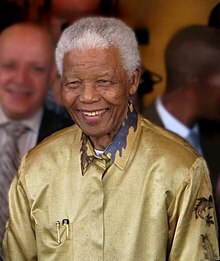 5 an Dùbhlachd - Nelson Mandela, ann an Johannesburg. Neach-poileataigs agus stàitire à Afraga a Deas. 14 an Dùbhlachd - Peadar Ó Tuathail, ann an Lunnainn. Actair à Èirinn. Air a tharraing à "https://gd.wikipedia.org/w/index.php?title=2013&oldid=525283"